As Autumn starts to emerge here I by contrast am feeling a desire to retreat, stay cozy at home, reflect, plan and perhaps in some ways nest in ready for the winter. The current thoughts in my mind center around aiming to be ‘sustainable’ in my creative practice, promoting my work, purchases and lifestyle choices. One thing that has been working well for me since I bought it is a big felt pin board that I have hung on the wall. On this I have used post it notes with pins to create columns with different categories such as projects, to-do, shop etc and then underneath it I can pin tasks or projects that I need to work on. I have also printed an A4 calendar for the next 3 months so I can see at a glance what I have coming up. Essentially a real-life visual trello board! I think this is really working for me because ultimately I am a visual person and also very much an out of site out of mind type of person too. 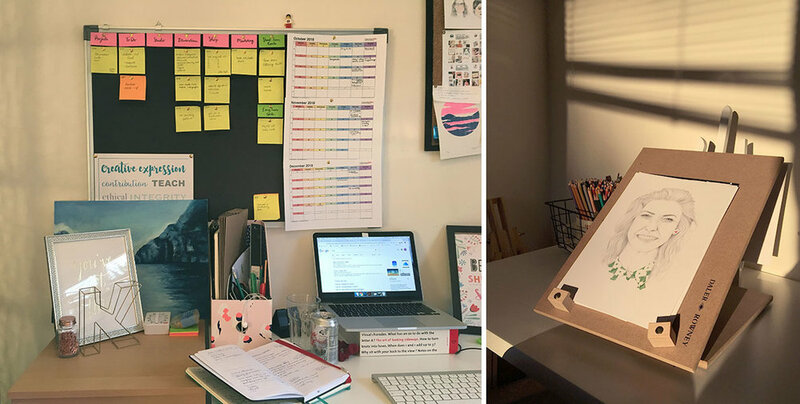 This can pair in nicely with a bullet journal or other system as well, but it just helps to keep the main things that need to be worked very visible. A really exciting thing I’m currently planning is to relaunch my shop this time using Shopify! Shopify has some great integrations for small business owners such as product tagging on Instagram, Facebook Shop and for me as a creative it has apps to sync with print on demand options for printing art prints and products. Whilst this is a more hands-off approach I think it is more sustainable for me as I work a full-time job as a designer. After a full day at work it’s important to come home and feel comfortable if I am sitting to create an illustration or to spend more time on a computer. As a small business owner you do have to weigh costs carefully but I think if something can help you and is within budget then it is really worth considering. So one of the purchases I have made this month is a new drawing board by Daler Rowney that is rotatable so you can position it however is most comfortable for drawing – I love it!